Companies that are successful with this strategy go beyond giving consumers attractive offers and samples. Brands benefit any time they make customers happy. Experiential marketing gives consumers feel-good emotions that are needed to cultivate true brand loyalty and customer lifetime value. In order for that to happen, brand warriors have to spread the word about their favorite companies and products. Brands must think outside of the box to standout. A perfect example of this would be what the Milwaukee Bucks did with their arena Fiserv Forum. Have you ever wondered how much goes into the strategy behind the design of a stadium? Milwaukee Bucks president Peter Feigin spent the past three years touring the top 20 sports and entertainment venues around the world. Each stop along the way he would take notes of their best features including the food and beverage vendors. Feigin took what he thought was the best features and incorporated them into what is now the new arena for the Milwaukee Bucks and Marquette University men’s basketball that sets a new standard for the industry. The NBA gave the Bucks three years to break ground on the new arena. If they didn’t complete this the league was going to force the team to relocate. The 714,000 square foot arena racked up to be a total of $524 million. When Feigin was hired, he led the way in 2015 to attain the remaining $250 million in public funds for the project. The state legislature approved the deal, signed by Governor Scott Walker to allocate the public funds. 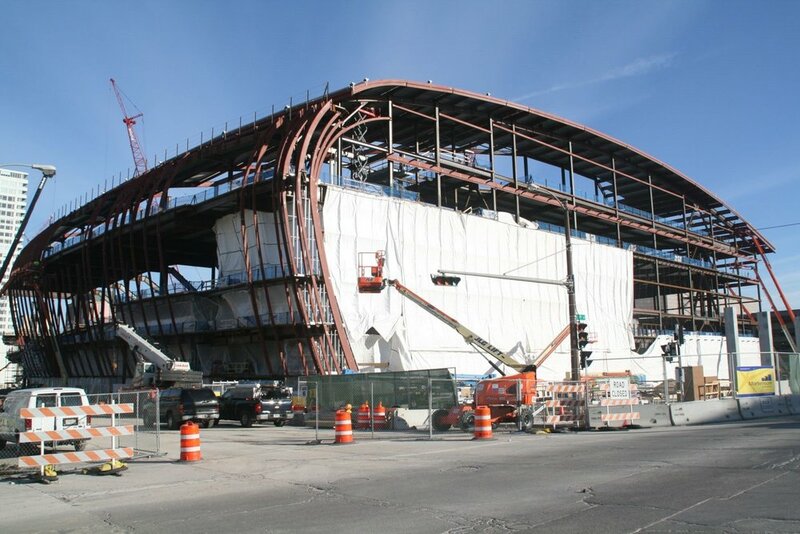 After that happened it allowed the Bucks to start construction in June the following year. If you want to see the construction process of this arena visit this website. Feigin wanted the arena to be the epitome of entertainment innovation. They accomplished this by having a 4,000 square foot custom center hung scoreboard, 17 fully equipped industrial kitchens and free high-speed Wi-Fi throughout the arena. The scoreboard is the 10th largest in the NBA and twice the size of the scoreboard in BMO Harris Bradley Center. These two arenas couldn’t be more different. The old arena had an enclosed concourses and tunnel hallways leading out to each section. With the new arena they created a more open concept by offering views of the court from anywhere not just the seats. Fans who would rather watch the game from their seats would feel “cozy” because there are slightly fewer seats in this arena. They did this on purpose to create an up-close environment and make customers feel close to the action. They created a very social arena by having a top-floor Panorama club with a bar and lounge area. Also, another unique feature they created was an outdoor balcony with a view of the court and on the other side a panoramic view of Milwaukee’s skyline. They wanted to get rid of the foil-wrapped hot dogs and soggy buns, so they incorporated 17 mini restaurants to have more fresh food within the arena. The point behind locally sourced food and beverage options is an effort to support local businesses. If you want to know more about the new arena and what else went into the process visit this website. This arena will be a major selling point for the university athletic program as it works to attract student athletes from around the world. The Milwaukee Bucks definitely set the bar high for experiential marketing and live experiences with this stadium. Sports are an enormous amount of global media consumption and are deeply ingrained in our lives today. Modern technology today now goes beyond just the game. Our mobile devices and social media accounts can connect us closer than ever with other sports fans, teams, and even our favorite players. Have you ever wondered how sports entertainment consumption has changed over time? Sports were always covered by newspapers, radio stations, and local television networks but that coverage wasn’t always the fastest way to stay connected. ESPN began in 1979 and the company has slowly integrated itself into the culture of sports and driving the way we consume it. Today so much of what we do as fans like root for our favorite team on TV, read about athletes online, listen to game analysis on the radio, is all intertwined with ESPN’s brand. Sports are the ultimate reality television show which arrives complete with many elements that programs try so hard to script. The advantage of sports is that producers don’t have to make up drama and the tension between athletes, the crowd feels when their favorite team scores or the uncertainty of the outcome. The idea of broadcasting sports 24 hours a day, seven days a week into America’s living rooms allows us to stay up to date with the latest news on their favorite teams and athletes. Another way that’s even better at staying connected to sports is by downloading the ESPN app on any mobile device. That way if you’re not near a tv or at the game you can stay up on the game through the app and even live stream the event. Also, if you follow your favorite sports team and athletes on social media sites you can keep up with them and see more personalized news. If you want to know more about how sports center has influenced sports consumption, you can visit this website. The rise of daily fantasy sports has completely changed the way consumers look at sports content. In daily fantasy sports every second of every game counts regardless of who is playing and what the score is. Once fans start playing fantasy sports they consume 40% more sports content across all media. With more people using fantasy sports it makes people watch teams and sports they wouldn’t normally watch. They would typically watch the live games till the very end. According to DraftKings, 50% of customers got into a sport they were not previously watching once they started using their site. 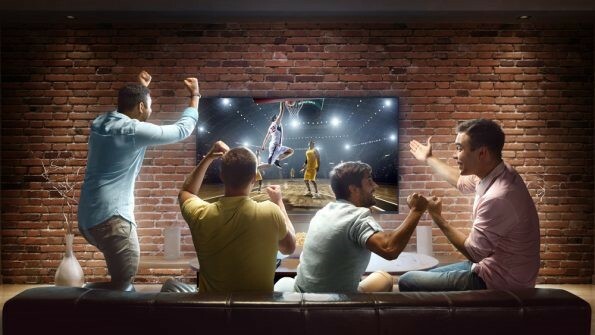 Daily fantasy sports have increased the value of TV rights contracts for American sports and increased advertising and television viewership. This also can directly correlate on the valuation of individual teams and specifically benefitting smaller markets with smaller viewership. The best way to experience for favorite team play is by actually going to the event. Experiencing the live atmosphere is the one thing you can’t replicate on a tv screen. No matter the weather, there’s something about being at a live sporting event that draws people in. The electricity in the air and the emotions in the crowds is something that cannot be felt outside of that setting. The memories created in those stadium seats will last forever and give you the full experience and leave you wanting more. Without fans, sports would not be around, they thrive off fan interaction. They create new ways to keep fans coming back and making it worth their money. One way by doing that is having halftime entertainment. We don’t always get to see the halftime shows on TV which is a privilege of going to the games. Today, in college especially in the Big Ten there are some top-notch marching bands at each and every game. Also, teams will sometimes have giveaways to the first couple hundred people who are at the stadium, which encourages people to go and spend more time and money there. More reasons on why live sports experiences are great entertainment view this website. Also, this video link below does a really good job summing up this blog and further explain how important technology really is for sports entertainment consumption today. Branding is about establishing an image that impacts how others view and think of you. As a sports team, your branding is more about the fans, sponsors, club members and their personalities and performance. It’s important for people to view your team in a certain way so they cheer for you and support you in the good seasons and the bad and most importantly respect you and be proud to be a part of the journey. Though branding isn’t just one single thing you do, there are certain steps you take to achieve success. Have you ever wondered how teams successfully brand themselves? 3 Ways Teams Achieve Successful Team Branding. Every sports team has a logo and that logo should represent what the team stands for. The logo is a way for a team to identify themselves and standout against the rest. The visual aspect of the logo is so important because humans are wired to identify images and use them to derive meaning. When people think of your sport you want the logo to be the first image that pops into their heads. If consumers see your logo all over they are more likely to remember it, especially over your competition. Thanks to the internet and social media, multiple platforms and devices will give your logo a bunch of exposure. You want the logo to flow nicely with color of the uniforms and have a nice shape. It has to be something that people want to wear and show off. Along with creating the right logo you want to have a message that associates with that logo that creates a lasting impression. Like for example with the Milwaukee Bucks they have Own The Future. Creating these things will help teams find their identity and increases fan loyalty. For more examples on why it’s important check out this website. Getting the right sponsorship for your team is very important. A brand can leverage marketing benefits from a sports team, athlete or event. Sponsorships offer exposure to an enormous number of consumers. Sports already is exciting to consumers, so if you add the excitement by paring up with the athlete, team or event to put the brand and mission in the heart of the exciting conversation. With paring up with a sponsor it will increase product and service sales. Sales directly drive by sports teams, stadiums, sports events and athletes. This is from giving the brand the benefit of having a concession stand in the stadium, a booth at an event, or using athletes to promote a product. With partnering with an athlete especially can generate marketing buzz. Field marketing teams like the ability to use athletes on a local level. For example, they could use an athlete to promote a new store opening. Word of mouth marketing is huge among athletes and then if people see it across their social media page they want to be a part of what their favorite athletes support. For more reasons on why to use sports sponsorships view this link. It’s important for every team that wants to be successful for a long time to invest in the players with the proper education, resources and opportunities. That way they are able to use the latest and most advanced athlete branding and marketing practices. The more a player can strategically keep fans engaged and excited with his or her athlete brand at scale, the more likely fans will look at the players posts and team- related content. The more fans that pay attention the more a team with benefit with better ratings and higher ticket and merchandise sales. 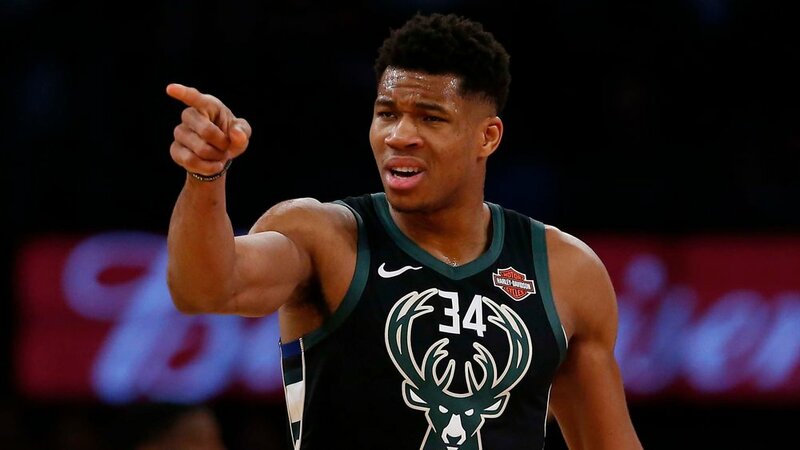 For the Milwaukee Bucks that player for them is definitely Giannis Antetokounmpo. He has helped turn that program around and help put them on the map while also helping them achieve their goals. For more ways on how a team can invest in an athlete view this link. I just listed a few ways but there are so many more things that go into branding a sports team and this link also shines some light on what the Milwaukee Bucks did with their rebranding process. WANT TO BOOST SPORTS MARKETING? SHOW YOUR ATHLETES AS PEOPLE. Back in the 1960’s, before NFL players were paid like rock stars and CEO’s, many athletes held other jobs outside of the football season to make ends meet. For example, Bob Long, a former wide receiver for the Green Bay Packers during the Lombardi era, owned and operated several Pizza Hut restaurants in the Fox Cities (Green Bay, Appleton, Oshkosh) area. In fact, one the Pizza Hut locations, located by Lambeau Field, is named after him! Today, despite not having the need to hold other jobs, many athletes are still finding ways to keep busy outside the season. Look at this video of NBA superstar LeBron James speaking at the opening of his new I Promise school in his hometown of Akron, Ohio, which will give underprivileged kids resources to get ahead in their education, and even provide resources for the parents: https://www.youtube.com/watch?v=TMEcUa3mcds If you listen to the start of the speech, he says “This is a huge moment for all of us” (James, 2018), stating that the school is meant to be something bigger than himself. As an aspiring intercollegiate athletic administrator, It is imperative to see the importance of emphasizing student-athletes as such: Kids who are going to college to further their dreams, but play sports as well. There is no in-between in this case. So, how do you apply that to marketing/fan experiences at the college level? But this new tradition shows us something. It shows a sign of unity. Look at the two pictures above. It’s not just the Iowa players and coaches. The pictures show the nationally renowned Ohio State football team and even the fans getting in on the tradition. Even if it’s just for a minute, the entire stadium comes together as one. No one is bigger than anyone else. As for how this could emphasize athletes as people, one thing comes to mind: story. One of the athletes, coaches, referees, or fans could have a family member or close friend who has had to battle childhood cancer or has had to care for someone diagnosed with it. That gives people reasons to connect with each other. What do you believe can be done to market student-athletes at the college level as people first? Where do we draw the line between promoting positive images for our athletes and overmilking stories for a profit? Out of all the different types of marketing out there, sports marketing genuinely seems to be the most popular form of marketing. 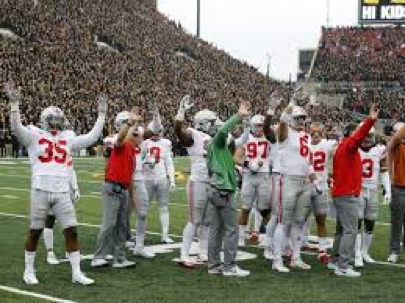 Sports means so much to so many people, and being able to market sports has become overwhelmingly attractive to many college students today, especially since sports are experiences and not necessarily tangible items. Sporting events are coming more popular than ever, and methods of fan engagement, as well as the increasing amount of corporate partnerships, could be responsible for that. In 2018, we have seen such a transformation in sports marketing. In a world becoming more and more reliant on digital communication, so many sports outlets have resorted to the use of social media content and digital strategies. As a result, these efforts have sparked fan bases and enabled to grow a personal connection to the team or player they root for. Fans now have access to professional photos, an endless variety of statistics, and opportunities to be recognized by sports organizations themselves. A popular way of recognition nowadays actually takes place at events. Many sports organizations give fans the opportunity to submit photos of themselves enjoying the game and have a chance to be featured on the video board or social media fan photo contests (WNAX). Not only that, more and more sports venues are now doing fan cams and other different promotions that get fans involved. These promotions range from tangible items to events that get a crowd involved (The Intell). Ultimately, these efforts are geared towards keeping people engaged to what is going on in the stadium, and keeping them in the stadium longer. It’s easy to get up and leave a game at any point, but if there’s so much to be a part of, why would you want to leave? In addition to experiences, companies have used sports more than ever to get their messages across. Whether it’s sponsoring the National League Championship Series, or it’s having an entry gate named after you, companies are taking every possible opportunity to get their name out there. They try to connect it to something a fan base has passion for as well. A prominent example is companies sponsoring t-shirt tosses, the seventh inning stretch, a fan cheer at a sports game, or even a series of chairs in an arena (BizTimes). Another prominent example is companies being the official sponsor of a specific food item at a stadium, like Johnsonville and Miller Park (Cait Covers the Bases). So many opportunities are out there to throw a name on something, and companies do not pass those opportunities. It seems like there is not one inch of a sporting venue nowadays that is not sponsored. Millions of spectators on an annual basis see their name, so sponsorships are their way to go. We have also seen a growth in the amount of reach sports teams have in terms of viewing markets. 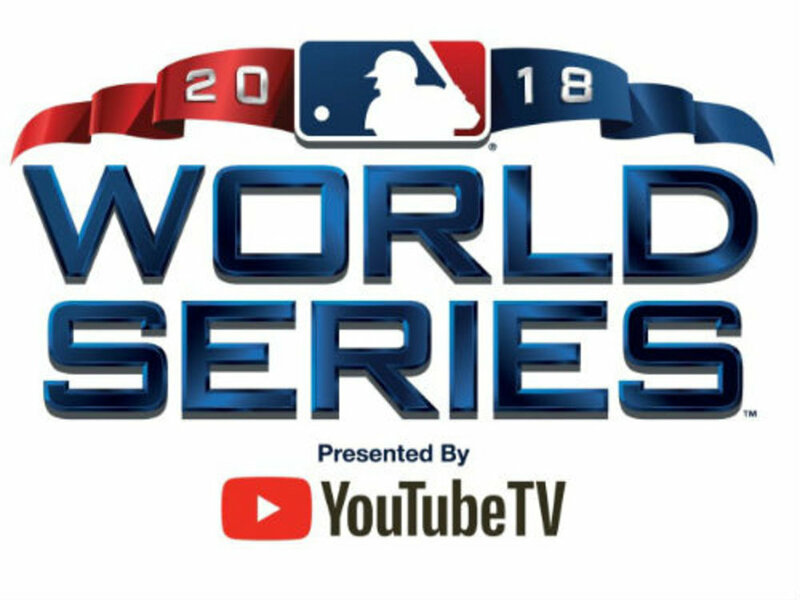 Many mobile and tech companies are now developing breakthroughs that allow residents of countries overseas to view each and every major American sports game (Portada Online). For example, China has become one the largest markets for the National Basketball Association. Broadening the reach of the product and tailoring to the engagement of certain cultures has truly allowed sports marketing to transform and be revolutionized in the process. As you can see, sports marketing is truly larger than ever. So, using what methods have sports teams been the most effective in marketing their product? Also, if given the opportunity to get into the sports marketing field, what steps would you take to further the growth of sports marketing?